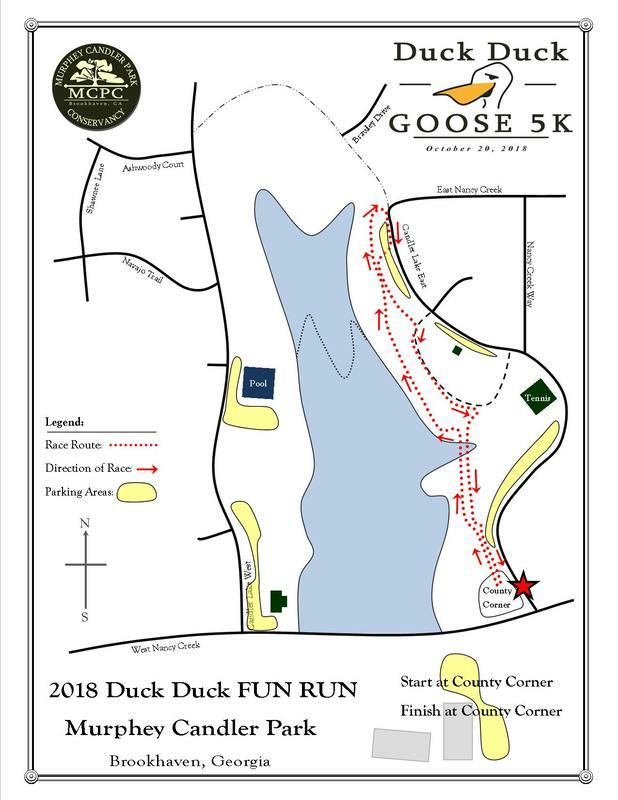 The Murphey Candler Park Conservancy (MCPC) is excited to announce the 5th Annual Duck Duck Goose 5K will take place on Saturday, October 20, 2018. This fundraiser supports the the Murphey Candler Park Conservancy and our efforts to make Murphey Candler Park one of the premier parks in Metro Atlanta. *If your friends and family are running with MES or MVPS Run Clubs, be sure to join those clubs when registering. Save money and register online by Sept. 20th. Online Registration Closes Wednesday, Oct.17 at Midnight! Paper registration is available. Please print the below registration form and mail in payment. By Friday, Oct.12th. Volunteers Are Still Needed to Make the Duck Duck Weekend a Success! We are in need of volunteers to make the Duck Duck Goose weekend a success. Please consider supporting your community and volunteer for various open positions. Positions include helping with race bag stuffing, race packet pickup, Duck Duck Food Truck and most importantly race day. Race day volunteers will receive a special Duck Duck Goose volunteer t-shirt. We thank you for supporting your park and community. Brookhaven Big Peach Running Co. - Thursday, Oct.18th from 4:00-7:00pm. T-shirts are not guaranteed. Cash or Checks made to MCPC only. Race Day Registration Table Saturday, Oct. 20th from 7:00-7:45am. T-shirts are not guaranteed. Cash or Checks made to MCPC only. The race packet includes your race number, t-shirt and promotional bag. Please bring photo ID and a permission letter if you are picking up for other participants. We recommend picking up the race packet early to avoid race day stress. ​Special Race Promotion: All Duck Duck Goose Race Participants will receive 15% off all Big Peach Running Co. merchandise in store on Thursday, Oct.18th. The race will start and end at the Murphey Candler Park Pool parking lot on Candler Lake West. New Open Field (aka County Corner) was completed recently and the race will begin there (Corner of Candler Lake East and West Nancy Creek Drive. 2018 5K Course Description: This scenic 5K run will start and finish at the Murphey Candler Park New Open Field (aka County Corner). Starting in the neighborhood on West Nancy Creek Drive participants will run over the dam and proceed left on Candler Lake West. After a turn around runners will enter park trail and stay in lake view until ascending up East Nancy Creek to Kittredge Magnet School, the course will once again enter the park. Participants will finish last leg on Candler Lake East before finishing in the Open Field. The entire fun run will be on the east side of the lake to avoid traffic on the dam. Participants will enjoy wooded trails, a lake view and a few rolling hills. Please park by 7:45am to avoid road closures as the 5k starts promptly at 8:00am. If you need to leave the event/ park prior to 9am or are only participating in the 1 mile fun run, please park in the Football/ Softball lots. Parking lots located on Candler Lake West maybe temporarily closed after 7:45am. Murphey Candler Park Parking Lot located on the corner of West Nancy Creek and Candler Lake West. Atlanta Colts Football and Murphey Candler Softball Lots located on West Nancy Creek opposite from the MCP Lake. Candler Lake East gravel lots. Please follow us on Twitter and Facebook @DDGoose5K for event updates. Don't hesitate to email if you have questions regarding this event. Race photos are posted. You may purchase prints through the above link.